Is your home slobproof? Debbie Wiener thinks every home should be livable and well designed at the same time. I love that! So, we're teaming up to talk color, design, and how to create beautiful spaces that make sense for everyday life on Thursday, October 28 at 3pm EST! Check out Debbie's book with "real-life" design solutions. Share your best and worst decor stories and tell us what you've learned along the way. We're looking for you to tell us your favorite colors from Benjamin Moore and how you've used them, too! RSVP so you can be included in the chance to win some great prizes like the House Beautiful 500 Favorite Paint Colors bookazine and Slobproof giveaways from Debbie! All you have to do is "like" Debbie's Facebook Page and leave a comment with your Twitter handle to be eligible to win! Ghislaine Vinas is a force. Her spirit bubbles over and is contagious when it comes to life and when it comes to design. I met her and her lovely husband, Jaime, a while back at the Interior Design Magazine's Hall of Fame Gala. Now, a Tribeca townhome she designed for long time client, Paige West, is featured in the current issue of Interior Design Magazine and even made the cover! Go Ghislaine! Cindy Allen, Editor in Chief of Interior Design Magazine, hosted a cocktail party sponsored by Benjamin Moore to celebrate the project. Here are some photos I took at the apartment earlier tonight at the event held for a few hundred of Ghislaine's biggest supporters (myself included). Some of my favorite moments in the house...and there were many more! The wallpaper in the lobby was designed by Ghislaine and her graphic designer husband, Jaime. Collaboration of beauty! The chandelier? It's made of Ping Pong balls. Another Jaime directed design-- the dining upholstery features photos of comfort foods that are so realistic, I almost grabbed that pickle. These stripes really are as perfect as they look-- of course, they used Benjamin Moore to get the looks throughout the house! The ceiling of the master bathroom is a gorgeous mural. Can't you just imagine taking a bath and looking up to this splendor? 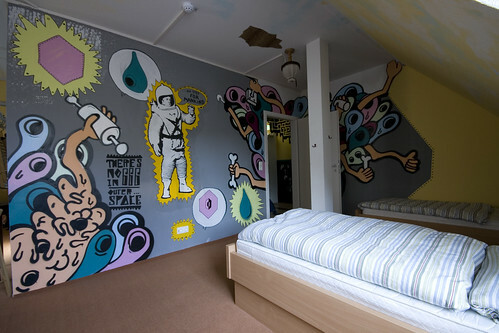 A shared room that is as much young at heart as it is all grown up with the mural art of Mark Mulroney. The party was in full effect. A new way to display your china...by affixing them to the walls. The master closet. No need for explanation. Yum. The guest room is so inviting. Andy Warhol adorns the windows. Pipecleaner artwork by the little inhabitant, I assume, hung casually on the wall. Obviously, creativity is alive and well in the next generation here. The stairs are a hidden surprise. They're industrial but still inviting. I think it has to do with the mix of brick and the industrial white paint with the giant offset numerals in Orange! A play area with great big stripes that race around the perimeter of the space. Doesn't it just make you want to add an extra touch of humor, color, and joy to your space, too? Ghislaine was also a winner of Benjamin Moore's 2010 HUE Awards. Follow this to find Interior Design Magazine's official slideshow of the townhome. 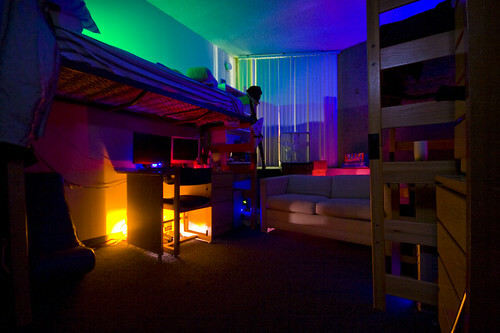 These days, dorms are a combination of high-tech gadgets and low maintenance style. 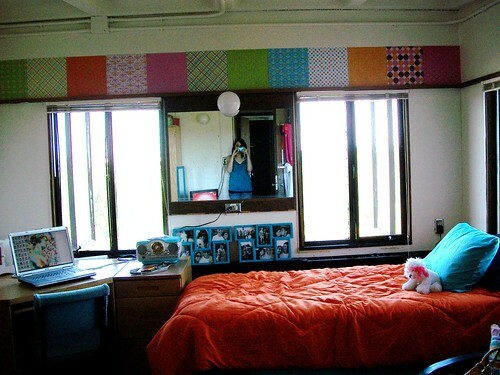 Here are some fabulous ways dorms are being done today. 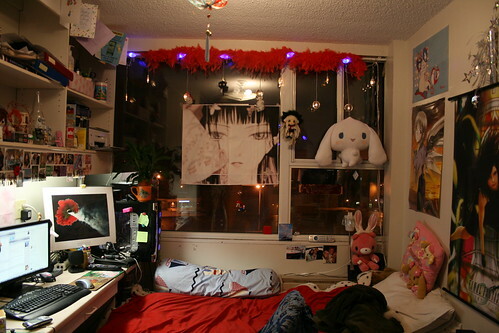 What does/did your dorm room look like? 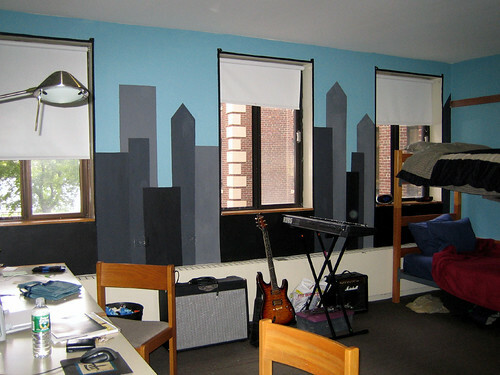 If you're inspired and want to start designing your own dorm room, go here to create a web-based 3-d rendering like the ones below of your dorm and actually buy all the accessories you choose. You can customize it and start buying the accessories you can't start the semester without. There's a bit of a love affair between Christiane and Benjamin, better known as Christiane Lemieux (of DwellStudio) and Benjamin Moore. The object of their affection is Color! I have to admit, I'm head over heels for approachable, yet leading style sensibilities that both companies share in design and color. One color choice for a nursery is Smoked Oyster 2109-40. See Christiane's other picks from Benjamin Moore for different rooms. When it comes to color, we know we have choices and sometimes it's hard to narrow it down. Have you ever tried repainting a wall and keeping everything else in tact? It can create big impact with very little time. DwellStudio is pairing some of their designs in rooms that are painted in Benjamin Moore's paint using three different color schemes to show how a room can change at the sweep of a paintbrush. Take a look at what simply changing color on the wall can do for your room. And here's where it gets personal...I have been neglecting my own master bedroom in my home. I know, I know-- bad designer behavior! As we were working with DwellStudio on this project, Christiane and her team shared with me their new collection of bedding and I found the perfect inspiration for my bedroom! Which of their new introductions do you think would work best? For me, a makeover is not just a surface treatment, but a changing of mindset and of mood. I think I'm ready to add some style to my most personal space. Now, I've sketched, planned, and I am ready to go! Over the next couple of weeks, I'll put my room together and share it with you. Stay tuned to see what was in MY box from DwellStudio. What will you put in YOURS? Park Avenue in New York City is no stranger to beauty. The restaurant by the same name evolves throughout the year with an intricate series of changes that recreates the interior to signal the changes in seasons. The team oat AvroKO designed the space around the concept of transformability. They believe in the space creating a feeling of exploration and used Captain James Cook's travels as a guide to their designs. The frames around the perimeter have a series of seasonal panels that instantly change the texture of the space. And all the coordinating details are devilishly perfect from the lighting to the menus. One look at the photos below and you'll see the instant impact of mood through Color! The idea of changing your space seasonally is so inspirational to me. With a little planning, I can easily imagine cycling in and out of accessories, an accent wall, and even dish towels to usher in color that reflects my seasonal taste. In fact, having a theme can help you create exploration in your own space. I've always thought restaurants were great sources of inspiration for residential kitchens and dining rooms. Park Avenue's approach gives us a fresh perspective on the idea. Lighting, color, and details make a world of difference! Does theme based design have to be seasonal? Of course not! Be brave and bold, design souls! I'm having visions of encouraging each member of the family to have a "design season" that reflects their tastes and choices. Learn about famous designers or artists an theme your space around their style. Use seasonal design as an opportunity to grow your knowledge and feed your imagination.